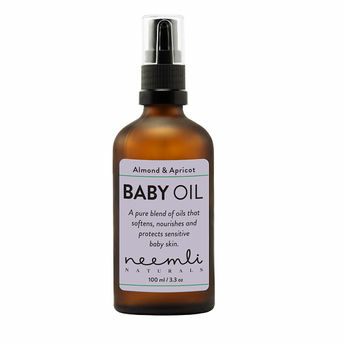 Neemli Naturals Almond & Apricot Baby Oil is a?pure blend of?organic certified oils?and?vitamin-rich?ingredients that help?soften, nourish?and?protect?sensitive baby skin. This ultimate baby oil is packed with the organic carrier and essential oils that replenish baby skin with all it's Vitamin A, B and E needs. 100% Natural, Cruelty-Free and Vegan ProductNeemli Naturals Products are formulated without: Synthetic ingredients, parabens, sodium lauryl sulfate, phthalates, chemicals, fillers, animal testing, mineral oils, petroleum, Animal based ingredients. About the Brand: Neemli Naturals line of skincare and bodycare products are sustainably sourced, environmentally friendly, safe and effective. The ingredients used in these products are scientifically proven with an emphasis on food grade, organic and cruelty-free that are not compromised on quality. The products are completely Handmade, Cruelty-free and 100% Natural. Explore the entire range of Creams, Lotions & Oils available on Nykaa. Shop more Neemli Naturals products here.You can browse through the complete world of Neemli Naturals Creams, Lotions & Oils .